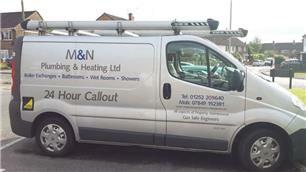 M & N Plumbing Limited - Bathrooms, Builder, Central Heating Engineer, Plumber based in Aldershot, Hampshire. The experts in gas central heating systems and plumbing , designs, solutions. 23 years’ experience, up to ten years guarantee on parts and labour, including boilers. 5 year free service plans available on new boiler installations, discount for senior citizens and all new customers. All plumbing, heating, drainage work undertaken. Bathrooms, kitchens, decorating and general building, fully guaranteed and friendly service. We use the best materials on every job. We pride ourselves on an excellent job. Every new boiler from Worcestor Bosch comes with a ten year guarantee on all parts and labour. We are proud members of Gas Safe so you'll be in safe hands. We have a really well respected client base which includes contracts with local doctors surgeries, local council. our customers have always been most important to us and take pride in our first class customer service we provide . Aldershot, Ascot, Basingstoke, Camberley, Farnham, Fleet, Guilford, Weybridge, Woking, Wokingham.